May 1st is May Day, a day to celebrate. It is Labour Day in Germany and in many other European countries as well, so it is a Feiertag or national holiday. The towns and roads are busy. 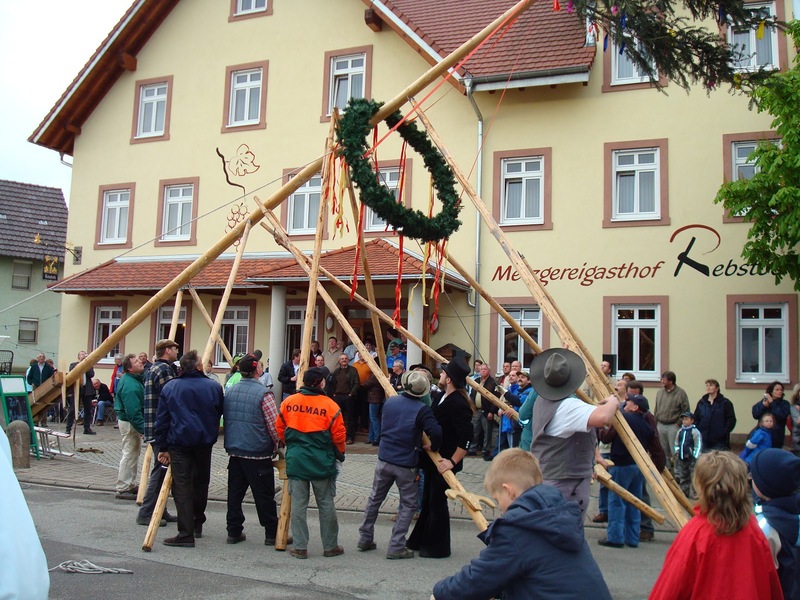 On the left is the Gasthaus Rebstock with their Maibaum and on the right, the bottom of the pole with several of the small businesses shown along it. We decided to head out and join in the celebrations. 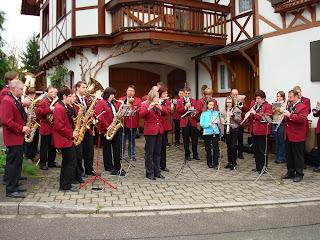 First, we stopped at the Rebstock in Münchweier where I took the above pictures. (That is our huge car in the forefront above.) Raising a Maibaum has been traditional here for some years now. It is carried out in late afternoon on the day before May Day as it is quite an event. That begins the celebrations. 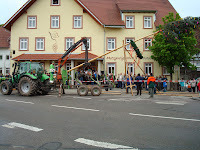 As we didn't see the raising of the tree this year, the following pictures, which I took a couple or so years ago, show the work that goes into it. 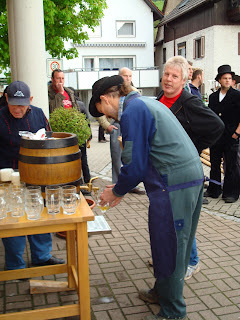 Every year it is the same: the band accompanies it all and the beer keg is tapped. Task completed. Now for the beer and music! 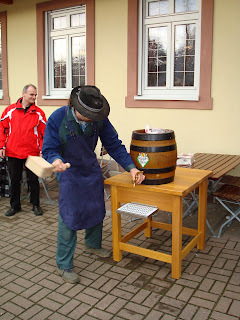 Below, tapping the keg and pouring the first glass. The Wirt in red is enjoying the occasion. As every year, including this year, the band plays on. The musicians are standing just across the street from the Rebstock. 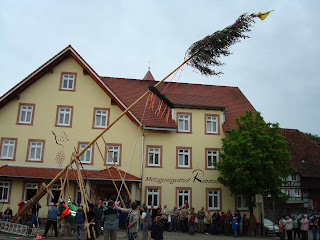 After we left the Rebstock, we continued on our way to Sulz, a small town just outside Lahr that also raises a Maibaum each year. As we were driving down the hill into the town itself, a wagon filled with celebrants was ahead of us. The men were enjoying a glass or two of beer. 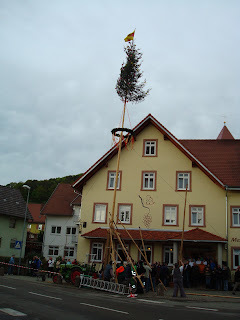 We followed them to the Rathaus (Town Hall), where we stopped to get a picture of Sulz's May Day tree. The Rathaus just ahead and the wagon still ahead of us. At the end, the Rathaus and Maibaum. After a brief stop, we headed towards the Hotel-Restaurant Dammenmühle and its new Brauerei where they brew the beer right there. 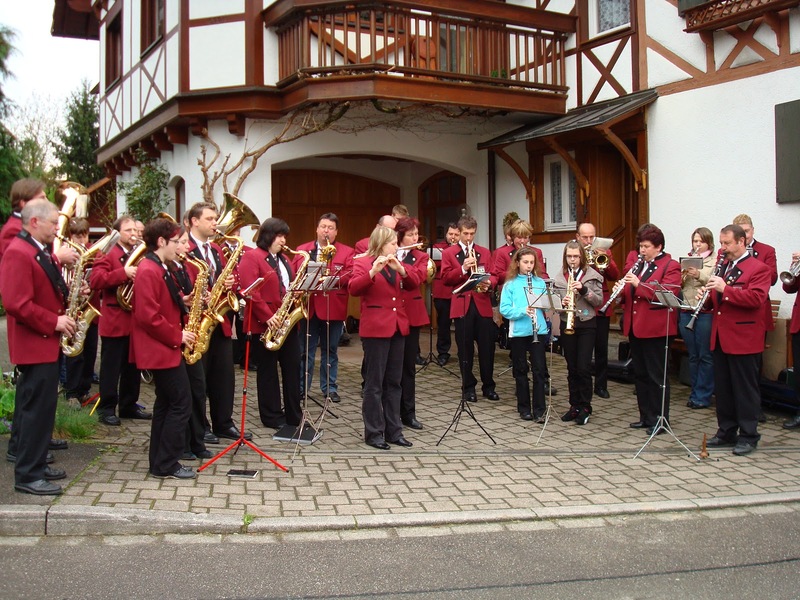 It is situated between Sulz and Lahr and only about two to three minutes from the Rathaus. The wagon group was there when we arrived. As I want to show quite a few pictures, I will have a separate blog post on that within the next few days. To give you a peek, here is Hans with a Mass of Dammenbräu outside the Gasthaus brewery. What a wonderful day that must have been! We lived in North Rhineland Westphalia for a time, as well as in Lahr, and the tradition there was to hang a little posy or basket of flowers on the door.